Basically, what we did is to perform 16S rRNA sequencing (V4 region, via MiSeq) on post-nasal aspirates (basically snot washed out of babies’ noses) collected from children as part of a cohort study called the Childhood Asthma Study run by the Telethon Kids institute in Perth, Western Australia. Samples were collected at around 2 months, 6 months and 12 months of age, during periods of respiratory health (i.e. no symptoms of respiratory illnesss for at least 1 month). Also, every time a baby developed symptoms of respiratory illness, a study nurse would come and examine the child and take another sample. The snots were divided into 4 aliquots each and cryofrozen until last year, when one aliquot each was thawed for DNA extraction. The 16S data showed very simple communities of bacteria in each sample… basically each sample was dominated by a single genus, either Staphylococcus, Corynebacterium, Alloiococcus, Moraxella, Streptococcus, or Haemophilus. Temporal colonization patterns indicated that most children were initially colonized with skin-associated organisms (Staphylococcus or Corynebacterium), which was replaced during the first year of life by stable colonization with Alloiococcus or Moraxella. Amongst the samples taken during episodes of respiratory illness, we found that Moraxella, Streptococcus, or Haemophilus were very common. We also found the presence of these bacterial genera was associated with increased severity of symptoms of respiratory illness – samples with these bacteria were more likely to be from infections that spread to the lower respiratory tract (i.e. where the child had wheeze or rattly chest) and experienced fever (signalling an inflammatory response). Importantly, we found that the children who experienced lower respiratory illness with fever were more likely to be chronic wheezers (i.e. asthmatic) at the age of 5 or 10 years, especially if they became sensitised to aeroallergens during their second year of life. 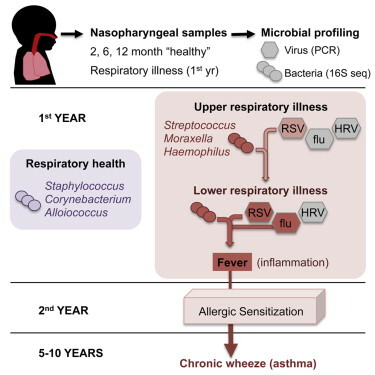 This suggests that Moraxella, Streptococcus, or Haemophilus colonization in infancy may be risk factors for severe respiratory illness and later asthma development. This could potentially explain earlier studies showing that colonization with M. catarrhalis, S. pneumoniae or H. influenzae (detected by culture) at the age of 1 month is associated with increased risk of asthma in childhood.